Have you considered playing a bigger game than the average property investor? What if we were to say that it might not be as far-fetched as you think? In fact, it’s quite feasible for a dedicated property investor to eventually be ranked in the top 1% of property investors in Australia. This would sound outrageous if it weren’t for the fact that we have clients and colleagues that fall into this ‘elite’ investor category. They’re not all high-income earners either. In fact, from our observations over the years, having a high income doesn’t always guarantee the best investment results. Ok, so what does it mean to be just an average property investor in Australia? Surprisingly, it means that you would be among the over 70 percent of landlords that have just one investment property. Even more surprising is that it’s quite likely that you would sell your investment property within five years. Despite media speculation portraying greedy investors snapping up multiple properties and making housing un-affordable for the rest of Australia, the commonplace reality looks quite different. 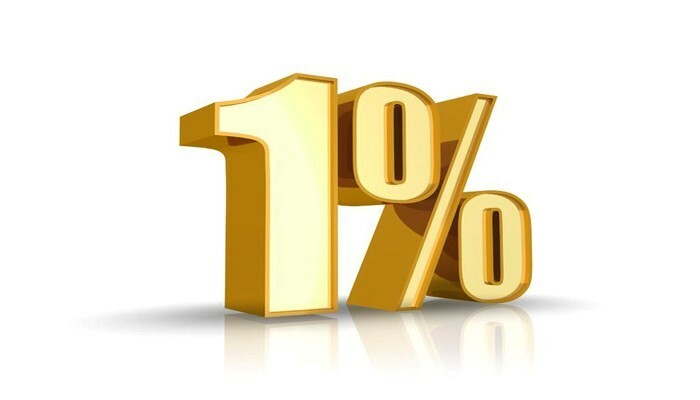 Owning two investment properties would put you in the top 19% of property investors, then the percentages decrease noticeably until ownership of 6 investment properties (or more) puts you within the top 1% of landlords in Australia. So, what do we conclude from all of this? Well for a nation of property lovers, we’re not as good at being serious property investors as we thought. The number of landlords with more than a couple of properties is small, especially if you consider them as a percentage of the of the overall tax paying population. With the overwhelming number of investors stopping at one investment property, the main concern to us is the apparent lack of investment vision, strategy and financial planning. This partly highlights a gap in traditional financial advice, where despite the clients risk profile and asset preference, multi property strategies are rarely recommended by financial planners, mostly due to compliance restraints. It’s easy to think that a lot of people may have prematurely exited their property journey due to disappointing results. It may well be inexperienced investors who haven’t considered the journey properly because of a lack of experience and planning, or indeed not getting the right qualified, independent advice. 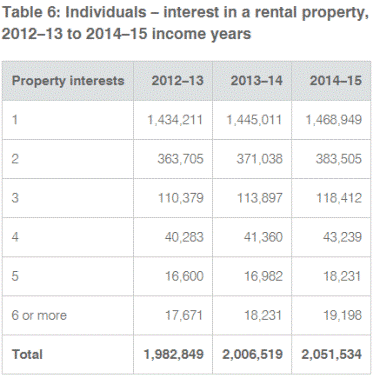 So how would it feel to be a 1% of property investor with 6 properties or more? In the short term you might feel pretty chuffed at achieving this milestone. However putting our egos aside, it would be a comfort to know that as long as you had a buy and hold strategy, your financial position in 15 years would be much stronger than most property investors. But owning six properties (or more) would be a hassle wouldn’t it? In fact, if the properties are well selected and you have access to the right advice, then your ongoing time commitment could be less than one hour per month to pay bills and keep track of your tax compliance information. Remember, you don’t have to actively manage these properties. As a 1% property investor with 6 properties, life gets easier. This is mostly due to the ‘peace of mind’ factor, knowing that you will have a genuine safety net in case your superannuation can’t provide you with the lifestyle you wanted for the 20+ years after you finish working. The table above is a clue to why a ‘plan B’ financial safety net is needed. 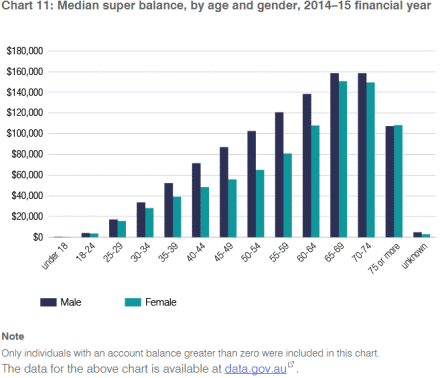 The typical Aussie (especially females), really don’t have enough funds in their superannuation to sustain a decent lifestyle for their retirement. And if you wanted even more motivation to build your asset base and become a ‘1% property investor’, consider how your standard of living will be on the age pension when you stop working. Now wouldn’t THAT be a pretty empty compromise after a lifetime of hard work? Note that we do believe in diversification of different asset types to mitigate risk, however due to our years of experience as advisers (and personal preference), we are comfortable in focusing attention on property investment as an income replacement strategy.